Once upon a time, I lived in a faraway land (called “California”) where I had three lemon trees. One was the size of an oak, and my husband would occasionally put on his bike helmet, go out back, and hit the lemons off with a broom so they wouldn’t fall on the heads of our visiting friends and knock them unconscious. It was a magical time. So I used to make fresh lemonade. Now that we live in Colorado, where I must pay actual money for lemons, I make the lemonade from bottled lemon juice…but I figure it’s still much better for us than the powdery stuff and takes about the same amount of time. And it’s fun to add in other fruits and herbs to spice up our drink sometimes. 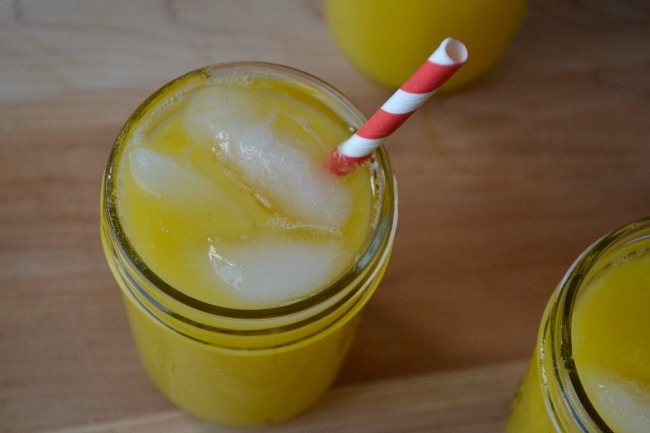 This sweet peach lemonade is one of my favorites. Alhough I can’t get good lemons here, Colorado does have tasty peaches…which we used last week for the sweet peach lemonade. Because the peaches are sweet, I cut the sugar for the lemonade a little. Every time I make this, I swear I should have doubled the recipe, because it goes pretty quickly — especially when neighbor kids are running through the yard, and kids are all over the place making messes and having fun. I’m so ready for summer. Make simple syrup by combining sugar and water in a saucepan. Heat and stir until sugar is completely dissolved. Turn off heat, add 1 c lemon juice and stir. Pour lemonade mixture into blender. Add peaches and blend until smooth. Cool, add 1 cup of ice, and serve. That sounds so Delicious! Mmm! Thanks so much for sharing with us at Thursday’s Temptation. I am going to be featuring this at tonights link party! Love this! We are featuring it as one of our featured recipes on Wonderful Food Wednesday – come and see at 7pm EST. Your lemonade looks fantastic! We would love to have you link this to our Saturday Link Party. It starts Fridays at 6pm, hope to see you there! I don’t care for plain lemonade, but this version with peach looks refreshing. Thanks so much for sharing your recipe at “The Saturday Spotlight party”! I love peaches…this sounds divine! How much does this recipe make? I am a little confused if you then you dilute the syrup to make a 2 quarts. It sound great and I want to try it but 1 cup of lemon is alot for just one glass. 🙂 Thanks. Oh, I love flavored lemonade. Blueberry is typically my favorite but I definitely want to try peach. Thank you so much for sharing this at the Pinworthy Projects Party. Thank you for sharing this recipe,I can’t wait to try it! I never realized how spoiled I was to have so much fruit year-round until I moved to a state where it snowed…by about Feb, I would kill for a peach around here! This looks so tasty! Peaches are in season here in Illinois. I will have to make this. Thanks for sharing the recipe! I. Would love. A peach tree!!! I so could’ve used this recipe last week! We came home from vacation with a huge box of peaches! This looks wonderful!